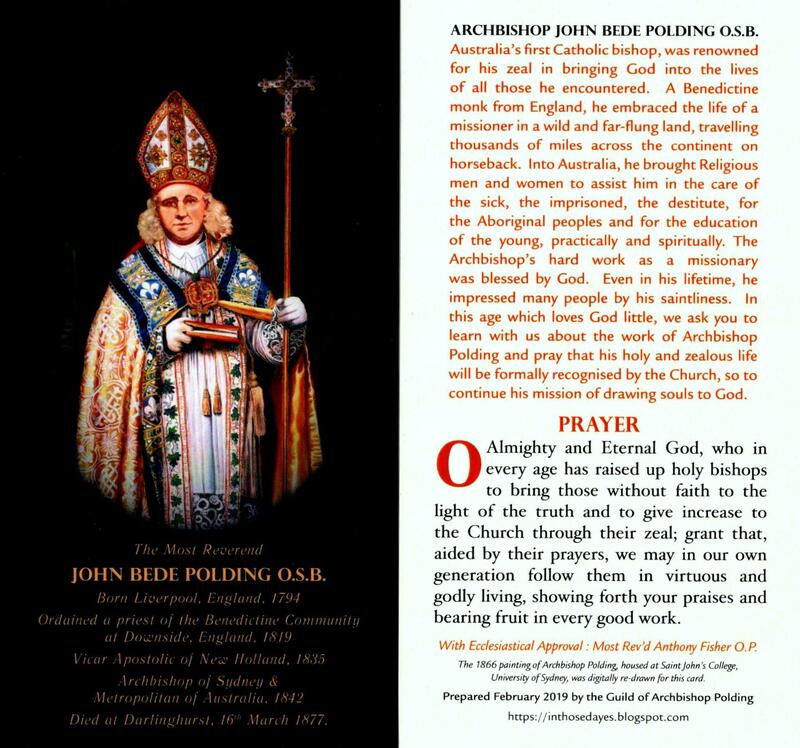 Previous Missal Moments here have focused on explaining the changes made in the English version of the third edition of the Roman Missal that came into use at the end of 2011 in Britain. The focus today is not any change as such, but on an element of the post-conciliar Roman Missal that has always been there, but too often poorly practised: the bidding prayers after the Homily (and Creed if there is one). When they are poorly done, it can be excruciating. When they are abused, they can be infuriating. No wonder many, even laity, often wish they might be omitted altogether. You have probably been exposed to this poor practice. There are the long, rambling, incoherent monologues that seek to tell the congregation (or even God sometimes if the reader is truly abysmal) the whole story behind the prayer. Sometimes they are so long an actual prayer is never made. Then there are the political manifestos, laden with editorial comment, in which the reader effectively preaches rather than intercedes. Even here I have heard diatribes against the authority of the Church and invectives against bankers, masquerading as intercessions. Then there is the often laudably brief intercession, which states the person/s being prayed for, but not the grace being sought for them. Some of the worst can be the spontaneous ones, in which the pray-er gets so muddled in his or her spontaneity that grammar ceases to function; or those which become sentimental addresses to God about nothing in particular. In England, they tend to be called bidding prayers. In Australia the favoured term is prayer of the faithful. In some places I have heard them termed general intercessions. 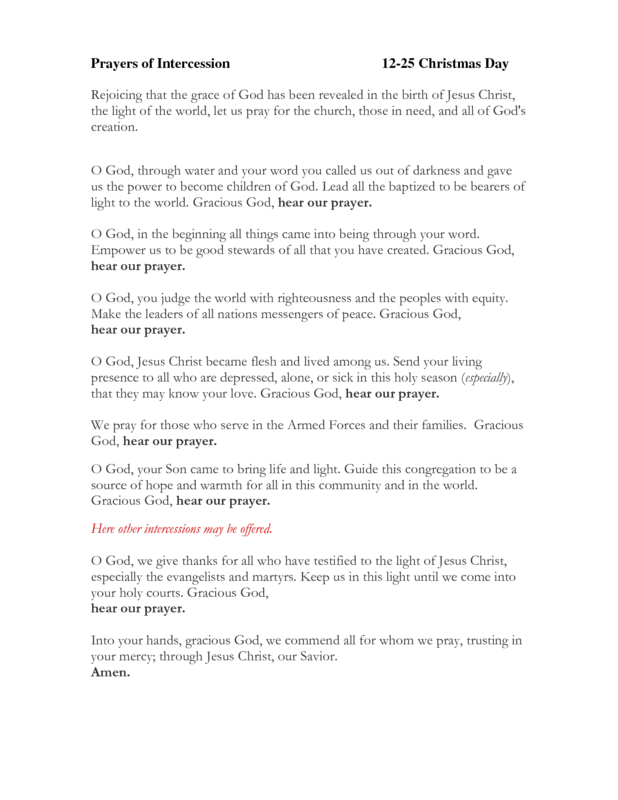 In the General Instruction of the Roman Missal or GIRM (2008) the phrase is Universal Prayer (though it mentions Prayer of the Faithful too). The name is important in revealing the true nature of this part of the Mass. Universal Prayer and General Intercessions are closest to the essence of this optional rite. (And yes, it is optional, though GIRM does say it is “desirable”.) It is a period of intercession for all beyond the confines of that small community at worship. It is when the congregation looks out of itself to embrace the wider community and intercede for the rest of the Church, and indeed for the world. This is it universal in scope, and general in context. We are not praying for ourselves, but for others. The theory is that having heard the Word proclaimed and preached, and on solemn days professed our faith, we are then moved quite naturally to look to the needs of others in response to God’s Word. We are called to move beyond self-absorption, both of the individual and of the congregation as an entity, to embrace the whole Church and the world at large in our prayer and our sacrifice. It is the moment when the baptised can augment their offering of the sacrifice of praise and their own selves with the sacrifice of intercession for others. Thus, these petitions should never be for ourselves, and usually not even for our own congregation. Normally I allow a short space of time at the end of the petitions for the people to offer their own particular petitions in “the silence of your hearts”, ending with the standard dialogue “Lord in your mercy/Hear our prayer”. There are two levels of structure to be remembered. The first concerns the subject order of the petitions; the second concerns the structure of the individual petition. Thus our petitions from the universal to the more particular, from the Church (which as it encompasses the Communion of Saints, is greater in scope than the world), to government, to the world at large, to those in particular need, to the needs of the community in which the congregation is situated. There should no reason at all ever to change this structure, and deacons and laity who lead these intercessions should be properly instructed in how to order them, and how to construct a petition. We should never hear the reader say “Lord, we ask…..” or the like. The reader is not talking to God but to the congregation, inviting them to pray for the announced intentions. Moreover, since it is an invitation, the phrasing should reflect this fact. Thus, “We pray for the….”. The phrase “We pray” is not an invitation but a declaration, and it is wholly inappropriate. How does the reader know that “we pray” for that intention. Rather the proper phrasing should be “Let us pray for…”. How NOT to do bidding prayers. Having announced the person/s being prayed for, the petition should then specify succinctly what is being sought for those persons. Thus a petition should have a structure something like “Let us pray for…, that….”. So an example might be, “Let us pray for the Church under its shepherds Pope Francis and the bishops, that together they might grow ever stronger in faith, hope and charity. Lord in your mercy./Hear our prayer.” The people’s response is their affirmation of the intention or petition and their presenting it to the Lord as the people of God. When, for example, we use the intercessions to offer thanks to God then we have lapsed into self-absorption again. After all, the Eucharist itself is the great thanksgiving. An excellent set of intercessions, tainted by the “We pray to the Lord”. So close! To the surprise of many, I am actually a fan of the general intercessions, but only when they are well done. If they cannot be done properly they should not be done at all. Properly includes the necessity for the petitions to have been drafted beforehand in writing, and approved by the priest celebrating the Mass. Spontaneous intercessions are dangerous, all too often ending in confusion, incoherence, poor grammar and syntax, and so becoming a burden to the congregation, not a help. Certain types of Protestant have a knack for making intercessions, a knack not found as often in Catholics. Therefore, the Catholic should draft the petitions beforehand, and have them approved by the priest. Brevity is also essential. Otherwise the point of the petition can end up being forgotten, and also there is a danger of lapsing into story telling or editorializing. Likewise, there should be only one reader of the intercessions. Having several readers of intercessors tends to lengthen the rite beyond reasonable bounds, and give it an importance that is not proper to this rite. It also risks reducing the rite to banality. In other words, too many cooks spoil the broth! Ideally, the intercessions should be announced by the deacon, or a competent layperson. This allows the witness value of having a non-priest offer the congregation’s petitions, since the petitions are meant to express the response of the people to the Word of God and to begin their preparation to take part in offering the Sacrifice. The Universal Prayer, or whatever name for it your prefer, should be given the same care and attention in preparation as any other part of the Mass. If done properly they can serve as a powerful and effective means of transition from the more passive reception of the Word of God to the more active offering of ourselves as a living sacrifice in union with Christ’s one sacrifice of the Cross made present on the altar. This movement of passive devotion to active devotion addresses the need we have to move from self to others, an evangelical movement that makes us intercessors for the whole world. There is a strong and lucid argument that holds the Universal Prayer to embody precisely the “useless repetition” that the Vatican Council sought to remove from the liturgy. The Mass itself is one great universal prayer, offered not only for ourselves but for the whole Church and for the salvation of the world. The argument is a powerful one, and it touches me deeply. However it strikes me that the Universal Prayer allows the people of God to articulate and become more conscious of their need to move their focus from self to others, and through others to God. In that sense it can be a fitting preparation for the Eucharist proper. I have never heard them called “Bidding Prayers”; interesting. 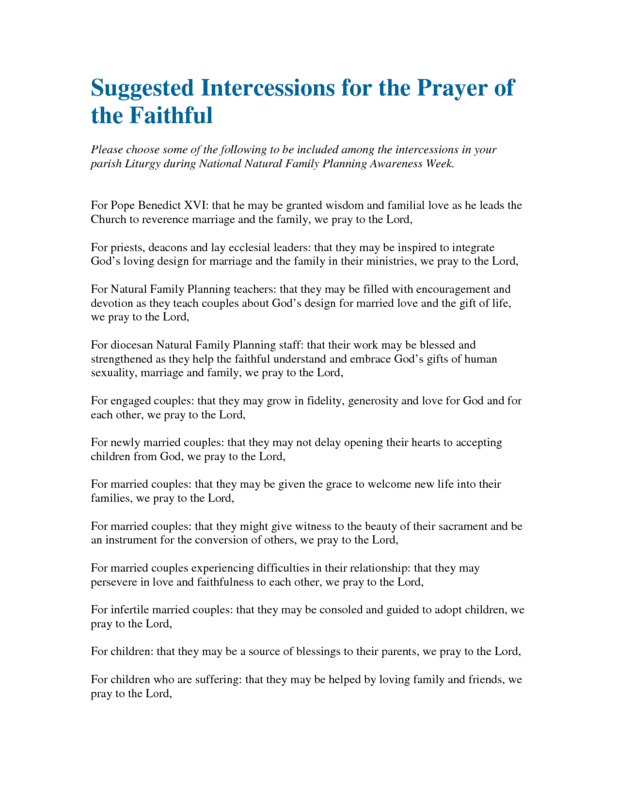 The “homely” name used in the States (or where I am) is simply “the petitions” or “Prayers of the Faithful”….even when we know that “General Intercessions” is proper. When I first became Catholic some 25 years ago, I was in a small Dominican parish out west, which had the lamentable (even I could see this at the time) practice of allowing the assembly to participate by not praying “in the silence of their own hearts” but calling out our intentions for all to hear and respond to. The most common problem was that we had to join our prayers to an intercession which we couldn’t really hear, but most disturbing was when people would use this opportunity to cause the entire congregation to join them in pleading to God in a questionable cause – I recall a few folks deciding that this was the time they could shout out their prayer that “John Milton win the election for County Treasurer” or that “My boss will decide to retire this year”. The ones that truly made me squirm were the occasions when this prayer was used more as a public announcement or [worse] chastisement: “In thanksgiving for our daughter’s acceptance at Notre Dame, we pray to the Lord.” or “That the women in this parish who serve as lectors would realize the importance of wearing modest clothing, and not boots and miniskirts, as we have seen today, we pray to the Lord.” I wasn’t in favor of the lector’s clothing choices, but I wanted to fall through the floor with mortification on her behalf nevertheless! That, Annie, is the great danger with spontaneous prayers “from the floor”! Inaudible, inappropriate, self-serving, sometimes even offensive intercessions are possible, and as you experienced like me, do happen. While it is a time for intercessions in the name of the people to be made, this does not necessarily mean all the people should be able to make one. It is yet another example of a profound misunderstanding of liturgy, and of “active participation” (a phrase I am coming to abhor!). Very helpful, Father: thank you. Would you like to make a comment on the practice of singing these Intercessions? BTW there are some of us here in Australia who do refer to them as “The Bidding Prayers”. At the Inauguration of Pope Francis, a new practice for the Papal Liturgies was employed: the Deacon sang an Introduction, and a layman gave the petition. I presume this was modelled on the structure of the Good Friday Bidding Prayers. Michael – hello, and thank you. Actually I would very much in favour of singing them, and in fact I should have mentioned that possibility. Arguably, it is even preferable. Since the intercessions have developed from a litany centred on Kyrie Eleison, as you know, and which survives in our penitential rite, singing is the proper mode of performance, even if only the call to pray and the response were sung, and not the petition itself. However singing the whole shebang would elevate the gravitas of the rite, and more effectively preclude those not trained up to sing them. I must have skipped that bit of the papal inauguration, but it sounds like you are spot on about the intercessions then being modelled on the Good Friday intercessions. A sensible development. Have they continued in papal liturgies? Another great topic Father Hugh. As your examples show, the General Intercessions are powerful when done properly. For instance, the gold standard of Good Friday Prayers of the Faithful. But maybe not the short sentences written and read (haltingly) by various kids at our Family Mass each month. I know this is to encourage the kids to ‘engage’ with Mass; but I feel the emphasis is a bit wrong. The kids are part of the Congregation so they should be actually praying for the intentions – that is how they participate. And they should really be engaging / participating all through Mass – not just when reading one prayer. As you can tell, I need lots of patience and prayer myself during Family Masses. Especially during the ‘hymns’ (just imagine the combination of maracas, tambourines and toddlers !). Confession time: I love families but I HATE family Masses It is usually code for “dumbed-down and hacked-about Mass”. The frisson I felt when I discovered that the Eucharistic Prayers for Children were not to be in the new Missal was scintillating. Every Mass is for every Catholic. Even celebratory Masses for, say, the opening of an ecclesiastical conference is still open and intended to engage everyone. Actually to modify the name in a restrictive sense, Family Mass, is really quite un-Catholic. Children also need to be reminded that the world will not always run to their instant gratification. For some things they have to wait, to prepare, to become ready. Why not also at Mass? There is that wonderful picture of the little boy crying into Cardinal Burke because he cannot yet receive First Communion like his big brother had just done – seen it? The “Family Mass” approach would be to give it to him anyway, to make him feel included. Cardinal Burke gave him the Catholic answer – “Don’t worry, your turn will come soon”. Waiting is good for us. It makes us value things all the more. I note that our abbey Mass we have had an increase in numbers of children attending. There is the occasional fidgeter or cryer, but they cope remarkably well with the psalms, the chant, the formality. It’s different, it’s interesting – hey, occasionally it is even mysterious. And the kids rather like it that way. We used to do them in our parish, and I’ll say when we started, they were dreadful, later they were much better. What we did that I liked was involve children and young people who were trained, and allowed them to be of service as ushers, greeters, candle-bearers; we had a few children who were outstanding lectors. We formed a schola of gifted singers who would contribute carefully rehearsed pieces. Children could be involved, but not willy-nilly, without training. We don’t do these any more (I sense you relaxing in relief), as the new pastor actually wanted Children’s Liturgy of the Word (which I abhor for the very reasons you mention – the Mass is for everyone). Anyway, a public apology for the days when I bought the idea that “involvement” had to mean participation – mindful or not! Oh Annie, you were hardly alone in equating participation with physical activity, and so many still do make that equation. Do not think I am against children doing things at Mass – far from it. But you get my meaning when you mention “willy-nilly”. Everyone who assists in some service role at Mass needs to be trained properly: priest, deacon, lectors, acolytes etc. The depth of the training will be the measure of how important a particular role is taken, and by implication how important we hold the liturgy to be. It will have the same desirable effect of delaying gratification of a desire, testing its spirit, and proving one’s worthiness to fulfil it. 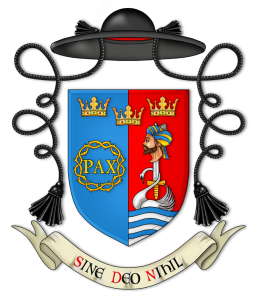 Truly I (and you I suspect) am now of the opinion (with my miniscule parochial experience!) that the only liturgical “accessory” needed for the liturgy vis a vis children is a crying room. Otherwise, suffer the little children to come to Him… with us! So I made it through the Family Mass – you described it perfectly as ‘dumbed-down / hacked about’. Full of ‘participation’ but minus the Gloria (! ); the lite Creed brought tears to my eyes; the Bidding Prayers were not too bad but somehow the six kids ended up saying them in the wrong order, and the hymns were a bit hit & miss. The Eucharistic Prayer for Children was enthusiastically included. No-one seems to kneel or bless themselves before & after Mass anymore. On a positive note, the Homily was fantastic and I could feel people really listening and thinking about our call to service. Also certificates were presented to the kids who had recently made their Confirmation – and they certainly set a great example about participating through paying attention to the whole of Mass. There was a strong sense of community after Mass with everybody staying around to talk afterwards; so I should not be too critical. The kids were well behaved tonight; I think that was because they had rehearsed their jobs during the week and were sitting with their families, not in a group together. I agree that kids should be encouraged to be greeters and candle-bearers and even lectors if they would like to contribute, but they definitely should not be pushed into it. For some kids, Mass is probably the only time during the week they are free of screens, endless learning opportunities, activities and stimulation. They certainly need a peaceful, beautiful, mysterious Mass to refresh their souls. And guess what – I am going to my first ever Latin Mass tomorrow evening – really looking forward to it ! P.S. the other reason this Family Mass felt a bit hacked about was because I was Commentator AND Special Minister of the Eucharist due to last minute roster changes. I actually don’t think parishioners should be serving as a Special Minister of the Eucharist at all, but I know that if we don’t do it then we cannot offer Communion under both species. Glad to hear that there were some pluses as well as minuses at the Confirmation Mass. Yet some of your pl;uses need to be in their proper context, e.g. while a strong sense of community should be a result of Mass, it is not the reason for Mass. Mass is for worship of God first, and our spiritual nourishment unto salvation next. So a strong sense of community does not excuse the abuses, sadly. You are right about Mass being for some kids a much-needed break from the screens that dominate modern life. But they need to see something radically different there. To be perfectly honest, Communion under both species is not sufficient cause for Extraordinary Ministers of Communion (note the correct name – it is important!). The desire to have Communion under both species is not “extraordinary” as it is quite licit, indeed the norm, to have Communion under the Host alone. No “more” Christ is received by having both species. Not to belittle your work; in fact, you can use it to ensure proper reverence is observed. Latin Mass? Do you mean the Extraordinary Form, or the Ordinary Form but in Latin? Either way, have a blessed time. Oops I knew I was going to get the name wrong – I knew it was not a Special Minister, but it gets called all sorts of incorrect things locally. I am not sure why this Archdiocese insists on Communion under both species. Certainly Communion was under the Host alone at the Latin Mass. I loved that Latin Mass ! I am such a novice I have no idea if it was EF or OF: maybe it was OF because I seemed to understand what was going on even though I could not understand most of the words ? Anyhow I found it beautiful, peaceful, calm, respectful and contemplative. There were no distractions from the Celebration of Mass. The Altar looked amazing. The parishioners were mostly silent (unless they were saying responses in Latin very quietly…), and a simple short unaccompanied hymn for processional & recessional. We knelt down through most of Mass – that helped me think about Christ’s suffering on the Cross. We even knelt down at a rail for Communion, and it was placed on our tongues. I just felt like my soul had been really refreshed. Point taken about the actual reason for Mass – unfortunately I think our parish sometimes emphasises creating a welcoming community over the celebration of Mass. (A bit Martha versus Mary really). This seems to happen mainly when it is an occasion where lots of non-parishioners attend, such as a child making a Sacrament. That sounds bizarre, but the fact is that the majority of parents & extended family do not go, and never have gone, to Mass. So the way Mass is celebrated and the elements of the liturgy undergo a subtle shift to cater for these people. They certainly feel welcomed and that they are part of a great community. I don’t know how the kids sustain their faith. The school can only do so much. And my little gifts of Rosary Beads probably go unused because it is hard for a kid to say the Rosary by themselves. Forgive my long-overdue answer: somehow your comment slipped through my radar. Your confusion as to which form of the Mass you refer to as the “Latin” Mass is not surprising. There is much general confusion about the term, so we need to be precise. Latin Mass should refer to what it literally means, any Mass celebrated in Latin, whether it be EF (which MUST be in Latin) or OF (which can be in Latin, and arguably should be – it is certainly the official language of the OF Mass). So, judging by the website you linked to, the Mass in question was EF, since the FSSP exists to celebrate the EF. That you understood what was going on suggests that the logic of the ritual action and symbolism was able to appear in full clarity from a worthy celebration. Thanks be to God! Confirmations especially can be trying time as extended family, most of whom have not darkened the door of a church for years, attend for what is to them a relative’s rite of passage, not a spiritual occasion of faith and grace. It becomes most obvious when the vast throng in attendance can produce only a whimper when making ritual responses, or when they come and receive Communion and treat the Host like a corn chip, their confusion in eyes looking questioningly and hesitantly (where is the salsa? is maybe what they are wondering). It’s all very depressing. The exaltation of “welcome” has been of a piece with the general degradation and decline of Catholic liturgy and practice. All that effort in vested in accosting visitors and regulars alike (as if regulars do not need to be welcomed to their own church!) is usually to the detriment of preparation for the Mass itself, not least spiritual preparation. All that activity more often than not hinders real spiritual activity and participation. It is the triumph of the go: if I am not doing something manual and visible, I cannot be participating – this attitude (often not fully conscious but ever so real nevertheless) effectively demeans spiritual activity and participation. This is why so many OF Masses are little better than public meetings. So I wonder now if we need to be less welcoming, or rather less obsessed with forcing our welcome on others, especially visitors. What will really impress visitors worth making regulars is not the marathon endurance of forced smiles and saccharine welcomes, but the worthiness of our worship and the depth of our devotion. I can feel another post coming on! Wherever you find the worship reverent, faithful to the Church’s teaching and instruction, and focused on God, then that is the place you should go. And if you have found it, thank God once more.